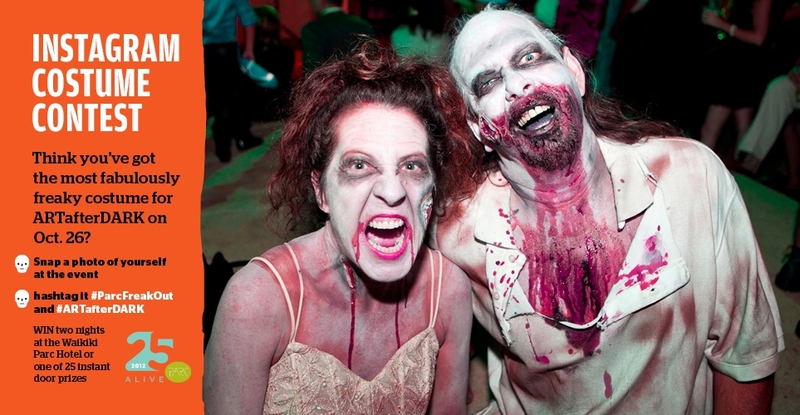 Your amazing costume could win you one of 25 instant prizes or a grand prize of two nights at the Waikiki Parc Hotel! Step 1: Take a photo of yourself in costume at ARTafterDARK: Freak Out with Instagram. Step 2: In the caption field, tell us what or who you’re dressed up as. You must include the hashtags #ParcFreakOut and #ARTafterDARK, and geotag your post Honolulu Museum of Art. 2. Entries must be submitted during the ARTafterDARK event—they must be geotagged "Honolulu Museum of Art" between 6 and 9pm on Oct. 26, 2012. 3. Waikiki Parc Hotel is not responsible for late, lost, or misdirected entries. 4. Entrants must be 18 years of age or older. 5. Employees of Waikiki Parc Hotel, Halekulani, Honolulu Museum of Art and its affiliates are not eligible to win the grand prize. 6. Winners of the 25 instant prizes must be present to win and will be notified via Instagram. Winners will be announced throughout the evening from the Central Courtyard stage, as well as via Instagram and email. Prizes must be picked up at the Waikiki Parc booth in Central Courtyard before the event ends at 9 p.m.
7. Winner of the grand prize will be announced on Waikikiparc.com and ARTafterDARK.org on October 31, 2012. Winner will be required to provide a valid email address to claim the prize. 8. All photos submitted will become property of Waikiki Parc Hotel and the Honolulu Museum of Art for usage in products or content.